Global demand for light vehicle original equipment manufacturer (OEM) automotive sensors will advance 11.8 percent annually to $15.9 billion in 2014, rebounding from depressed 2009 levels. In addition to the expected recovery from the 2009 recession, automotive sensor demand will gain uplift from increasing regulatory pressure and the continued search among automakers for cost-effective ways to differentiate their products. Sensor demand grows hand-in-hand with electronics demand, which itself has expanded substantially during the past decade, despite the impact of the recession in developed markets. These and other trends are presented in World Automotive Sensors, a new study from The Freedonia Group, Inc., a Cleveland-based industry market research firm. The automotive OEM sensor industry in developed markets is dynamic and constantly changing, as new sensing technologies experience massive growth while well-established products face flat or declining prospects as they are superseded by newer technology or integrated into other applications. Emerging markets typically have more basic sensor needs and focus on technologies long-standard in developed countries. Examples include now-basic safety technologies such as standard airbags and antilock brake systems, powertrain and emissions applications (like port fuel injection), and closed-loop catalytic converter systems. The 2009 recession caused developed and emerging automotive markets to bifurcate, with the former suffering from massive sales drop-offs while the latter moved forward, apparently from strength to strength. The sheer recession-caused abnormality of the global market for light vehicles and the electronics and sensors they contain can be seen in 2009 sales performance. Light vehicle sales in the key developed markets of the US, Western Europe and Japan fell 9.2, 2.1 and 4.4 percent per year, respectively, from 2004 to 2009, while ascendant emerging markets Brazil, China, and India grew 14.1, 26.4 and 12.1 percent, respectively, during the same period. While the faster-growing emerging markets will likely set the global pace going forward, they do not produce the same per-vehicle sensor revenues because many of the sensor technologies they currently contain and will use in the future have already been commoditized in terms of price. © 2010 by The Freedonia Group, Inc. Magnetic sensors are one of the important market segments in the sensors industry due mainly to their applications in the automotive industry. Example: Automotive sensors that measure rotation, speed, angle, and position in a car. However, over time, magnetic sensors have expanded their reach from mainly the automotive industry to include the industrial, medical, aerospace and defense, and computers industries among others. Their range of applications goes from high-cost industrial motors applications to low-cost consumer applications. However magnetic sensors face competition from technologies that target similar end-user applications. Variable reluctance, Hall Ics and MR sensors are the different magnetic sensor technologies that can be used in automotive applications. However, the VR sensors market has almost faded out due mainly to Hall Ics that were successful in replacing these sensors to a large extent, leaving Hall Ics and MR sensors as the strong contenders in this market. As mentioned earlier, automotive applications remain one of the favorite hotspots for magnetic sensors including Hall Ics and MR sensors. The recent trend however indicates that other markets such as cell phones and consumer electronic applications have increased in importance for magnetic sensors manufacturers. Here again, Hall Ics and MR sensors are vying for these new growing markets. While the automotive industry still generates significant revenues for vendors of magnetic sensors, recent trends in the communications sector have led manufacturers to focus heavily on the fast growing and high volume cell phones markets. However, the unit price of magnetic sensors used in these applications is less than those used in automotive applications. Still, cell phones and other applications are a significantly high volume market, given that billions of cell phones are made every year as opposed to millions of cars made every year. An interesting comparison can be drawn here with MEMS based sensors. MEMS sensors, which were also initially inclined more towards automotive applications (airbags and TPMS, etc) are now used heavily in cell phones, camcorders, and other electronic devices. This has led to mass adoption of MEMS sensors, increasing their larger customer base and generating more attention for such sensors. As a result, many MEMS manufacturers have taken the consumer electronic devices market seriously. The reasons for this are very high volumes, the fact that the electronic devices market undergoes tremendous changes in a short span of time, and it is open to and welcome new technologies easily unlike the automotive industry in which it takes time for end-users to accept a new technology. Reliance on tried and tested technologies hinders the penetration of new technologies in the automotive industry. One of the other reasons has to do with the fact that supplying sensors to consumer electronic applications is easier compared to supplying sensors to the automotive industry where the technical and testing requirements are rigid. Convincing automotive end-users of adopting a new magnetic sensor is a Herculean task. Magnetic sensors have been used in many computer-related applications for years, but their penetration in cell phones, especially for e-compassing, is a recent and an important trend. Cell phones that have an automatic wake up function use magnetic sensors. Clamshell slide openings or a swivel opening are some types of cell phones that turn on as soon as the user flips it open or slides it open. Within the cell phones market, electronic compassing is the latest application that is driving demand for magnetic sensors. The electronic compass market for GPS-equipped mobile phones emerged in 2009 and is expected to accelerate the demand for magnetic sensors that can measure small magnetic fields. These sensors are also used to indicate when a washing machine or a refrigerator door is shut, or a folding display in a phone, notebook PC or digital camera is open, or to adjust motors that help deliver sharp, blur-free pictures. Magnetic sensors for low-cost switches that are used in consumer electronics and appliances, PCs and notebooks represent the vast majority of unit shipments. Having said that, the future looks bright for magnetic sensors in their traditional applications as well. Many magnetic sensors are needed in today's cars, and many more will be required in the future. But magnetic sensors are certainly expanding their reach from automotive to cell Phones and consumer electronics applications. 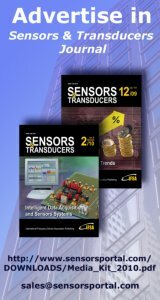 This study discusses the world magnetic sensors markets. Sensors are defined as sensing elements and any other electronics or modules or sub-systems have not been calculated in the evaluation of this market. Research findings show that the penetration of magnetic sensors in cell phones and other consumer electronic applications is increasing, while automotive continues to be a major end-user market for magnetic sensors. Hall IC, Magneto Resistive (AMR and GMR) sensors and Superconducting Quantum Interference Devices (low and high temperature SQUID) are the types of magnetic sensors covered in this research service. According to a new research report by Frost & Sullivan, the "Biosensors market is categorized as a growth market [and] is expected to grow from $6.72 billion in 2009 to $14.42 billion in 2016." Biosensor adoption is increasing every year and the number of biosensor applications is continuously growing. Biosensors are currently utilized in over 26 applications with a large bulk of revenues originating within the point of care market. However, research analysts expect considerable growth to start emerging from the biodefense and home diagnostic market sectors in the near future considering the "development of newer biosensors is likely to change with newer application research." Biosensors are sensing devices containing a biological element that detects chemicals in a system. Biosensors are utilized in various fields. Common applications for these devices include: environmental monitoring of pollution, food analysis, hazardous chemicals detection, genetic disorders detection, diagnosing medical conditions. Frost & Sullivan's report provides a comprehensive analysis of the biosensors market complete with definitions. Discussions on market dynamics, competitive structure, key market drivers and restraints, and market segmentation are included. The report also provides revenue analysis and forecasts, as well as information regarding acquisitions, mergers, alliances, and market shares. Powered by the seemingly recession-proof performance of the mobile phone and consumer electronics segments, the market for Microelectromechanical (MEMS) sensors is set to return to growth in 2010 after two straight years of decline, according to iSuppli Corp. Approaching a point close to the historical peak of 2007, MEMS revenue this year is projected to reach $6.54 billion, up 11.1 percent from $5.88 billion last year. The double-digit expansion predicted for 2010 compares to a decline of 6.8 percent posted in 2009, on top of a 3.6 percent contraction in 2008, iSuppli figures show. The market will continue to expand through 2014, when it will have grown another $3.3 billion to hit $9.8 billion—equivalent to a Compound Annual Growth Rate (CAGR) of 10.7 percent throughout the 2009-2014 period. Figure 1. iSuppli’s MEMS revenue forecast from 2006 to 2014, with revenue dipping in 2008 and then bottoming out in 2009 as a result of the global recession. The expected rise in MEMS revenue this year will mirror an equivalent increase in MEMS unit shipments, anticipated to reach 4.14 billion units, up from 3.44 billion units in 2009. 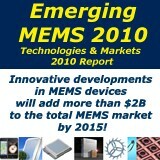 Overall, MEMS shipments will log an impressive 19.5 percent CAGR to top 8.5 billion units by 2014, iSuppli data indicate. “MEMS production is back on the fast track,” said Jérémie Bouchaud, director and principal analyst for MEMS and sensors at iSuppli. “Beginning in September 2009, MEMS manufacturing began to grow at a rate that came close to the high-level mark set three years ago in 2007. In particular, the MEMS market is being fueled by the continuing might of MEMS applications for consumer electronic devices and mobile handsets. These two sectors bulldozed their way through the economic crisis, in the process cementing their status as the new locomotive for MEMS.” By 2014, Bouchaud said both sectors will generate $3.2 billion in value, accounting for 32 percent of total MEMS market revenues. MEMS sensor production for automotive applications likewise remains high, with the market set to rebound in 2010 after a fall last year. Factors stimulating the growth of automotive MEMS include anticipated stronger shipments of cars from 2010 to 2014, mandates in the United States and Europe for vehicular safety systems, and continuing regulation in the reduction of harmful emissions. 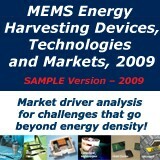 Also enjoying robust growth is the high-value MEMS market for the industrial, medical and aerospace-defense sectors. With a projected CAGR of 13.7 percent from 2009 to 2014, the MEMS market for these segments will be worth $2.3 billion at the end of the forecast period, iSuppli data show. Among MEMS devices, three segments will exceed the $1 billion mark this year, and two others will be close to joining that list by 2014. Inkjet printheads will remain the dominant-selling MEMS device from now until the end of 2014, with revenue exceeding $2 billion that year. However, growth in this segment is stagnating and will experience dwindling shipments as the market transitions from disposable to permanent printheads. Rounding out the top 5—along with their projected revenue in 2014—are accelerometers, in second place with $1.7 billion; pressure sensors, in third with $1.4 billion; gyroscopes, in fourth with $961 million; and optical MEMS for displays, in fifth with $940 million. For 2011, MEMS displays will make a comeback, thanks not only to pico projectors but also to new types of MEMS flat-panel technologies for portable electronics. MEMS microphones and BAW filters will increase their penetration, while completely new types of MEMS actuators will bring significant additional revenue for switches or varicaps and autofocus for camera phones. Learn more about the latest results in the MEMS market with the new report, MEMS Back to Double-Digit Growth.